Well, it's Hump-Day, and that means it's time for the blog here to plug one of my own literary works! This Wednesday, I want to feature one of my favorite projects; and one that was a tremendous amount of fun to write: Best in Show: The Films of Christopher Guest and Company. Published by Applause Theatre and Cinema Books just about a year ago, this is my study of auteur Guest and his "documentary-style" (don't call them mockumentaries!) comedies Waiting for Guffman (1997), Best in Show (2000) and A Mighty Wind (2003). The book also features a detailed section on Guest's history in Hollywood, from his stint with National Lampoon in the early 1970s, to Saturday Night Live in the 1980s, and even the classic This is Spinal Tap. The book also features brand new (and extensive) interviews with a whole cast of characters from Mr. Guest's informal repertory company, including Harry Shearer, Fred Willard, Bob Balaban, Michael Hitchcock and Jim Piddock. Here's what the critics say about Best in Show: The Films of Christopher Guest & Company. "Muir reports the mechanics behind Guest's improvisation on film, then proceeds to full background and smart analyses (for which he draws on interviews with the principal cast and crew) of Guest's classics: Waiting for Guffman, Best in Show, and A Mighty Wind. In addition to Guest cultists, this book should interest fans of Robert Altman, Monty Python, Peter Sellers, Richard Lester, indeed British and American comedy in general. Muir eschews the academic tone for zippy journalese, but this insightful study certainly establishes Guest as a solid, coherent, and original artist...Highly recommended." - CHOICE, March 2005. "Guest is an original, and Muir does a superb job of illuminating Guest's qualities as a person, performer and director...The great value of reading about this quirky creator is absorbing his message, which applies to moviemakers and laymen alike: blaze your own path and have enough self-belief to buck the tide of conventional opinion. "-PUBLISHER'S WEEKLY, Oct. 25, 2004, page 35. "...a nicely informative overview and critical study of Guest's improv flicks, including a lot of background on their rather unorthodox construction and methodology." - IGN FILM FORCE, "Weekend Shopping Guide," 11/12/04. "Although only three films directed by Christopher Guest are highlighted in this book, writer John Kenneth Muir is on to something in treating them like an oeuvre...there are fascinating tidbits of information here, from the initial appearance of Tap's guitarist Nigel Tufnel...to how the filmmakers had to get clearance rights for Guffman's oddball series of action figures such as The Remains of the Day and My Dinner With Andre - and had to convince hesitant Brat Packers that it was a good idea. This is an enjoyable read for fans of Guest..." - Terry Morgan, BACKSTAGE WEST, October 28, 2004, page 3-A. "If you agree that Christopher Guest is the funniest director of the last decade, if you're waiting impatiently to buy the deluxe boxed set of "Waiting for Guffman" "Best in Show" and "A Mighty Wind," then give yourself a book for a Christmas present: "Best in Show: The Films of Christopher Guest and Company. "...Muir has written an entertaining combination of behind-the-scenes tale and quick analysis of Guest's work....After touching on Guest's other directing (notably "Almost Heroes") and his memorable work in "This is Spinal Tap," Muir delves into the three masterpieces of ensemble acting and improvisation...If you haven't seen them, you should - and use Muir's book afterward to relive your pleasure." - Lawrence Toppman, THE CHARLOTTE OBSERVER: "The Skinny on Movies: Monroe writer's Guest shot merits readers' attention." December 10, 2004. "Lovers of hilariously gentle satire will want to look at Best in Show: The Films of Christopher Guest and Company, by John Kenneth Muir...Film writer Muir follows the fortunes of cast members and traces the evolution and development of the films. Rock'n'roll, believers!" - GLOBE & MAIL, December 18, 2004. 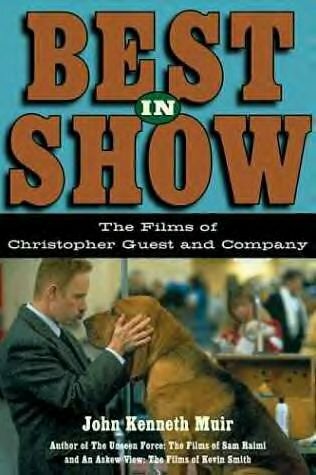 "Muir's book, Best in Show: The Films of Christopher Guest and Company, is riddled with rich, behind-the-scenes anecdotes that paint Guest as a daring yet patient innovator who kindles actors to act through spontaneity rather than rehearsal. Muir is able to construct a book that shows off an amazing research effort without coming off as too academic. In other words, it's informative and still highly entertaining." - Mike Ward, "Guest Work," Richmond.com, Jan. 20, 2005. So, if you're looking for a fun read about some very funny flicks, click on the link below! Awesome book, I'm very glad I picked it up! The best is how you sit back and let the writers/performers tell the majority of the story. Not all show-offy and butting in too much like other books in this genre... Really one of the funnest most interesting reads I ever had. Hey, Jordan! Thank you for your very kind words about my book. Means a lot to me that you enjoyed it so much; especially since you're the maker of an outstanding mockumentary in your own right!